I've been working on a new website. It's definitely a work-in-progress, but I thought I'd open it up to the general public. If you are looking for magicians in Milwaukee, then take a look at the site. If you would just like to critique my work, feel free to drop me a line. 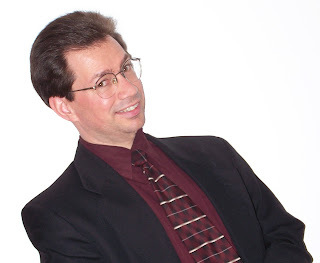 Several years ago, prior to going full-time as a magician, I worked as a technical writer. As part of that position, I designed and maintained a couple websites at a large company in Milwaukee. My skills as a website designer are a bit out of date. So, in my spare time, I've been attempting to learn more in this area. It would seem that my hobby has become my career, and my career has become my hobby. Then, be sure to visit my website and complete the party by booking Great Scott to come to your child's magical birthday party. Thanksgiving day is almost here. It's a day that sort of gets lost in the rush toward Christmas and all the shopping, hussle and bussle. So I would like to encourage you to, along with me, take a little time and consider all that you have to be thankful for. It's been a full year. Some things have gone my way. Some things haven't. I've had some disappointments...and some triumphs. If I'm to be honest with myself, I'd rather not go through the 'down' times. But it is also those very times that provide the perspective that brings me true thanks. In fact, that's what Thanksgiving is about. Consider that first Thanksgiving at Plymouth. It had been a long, hard 10 months getting that colony established. Months filled with struggle and no-doubt some fear. That's why they gave thanks when the harvest came in. They had some perspective. Consider also that first proclamation for a National day of thanks from Abraham Lincoln. The country was in the midst of a civil war. However, there was hope. That is what that proclamation was about. Here it is, almost November. Where is the time going to? This whole month was busy, but more so in the last week. I've been in several child care centers performing my Goofy Monster Magic show. Most of those were evening shows for their fall parties. These are fun events where the kids and their parents come and enjoy an evening of fun, along with a meal and in my case, a Great Scott magic show! There were several private house parties as well. Halloween seems to have grown through the years. Now parents and kids get involved and get dressed up in character. I think many of the parents enjoy the costumes more than the kids -- if the truth were known. But it's all in fun. 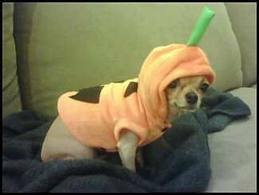 Case in point -- at one party last night, the host had dressed her dog in a pumpkin costume. Yes, its name actually is Pumpkin... My kind of humor. Magic -- Rain or Shine! This past weekend I was busy with shows all over Wisconsin. I entertained at several Birthday parties, Halloween parties, a country club and a pumpkin farm. All were inside -- luckily for me. I was out to Woldvogel's Pumpkin Farm in Juneau to perform a magic show for the families that visit over the weekend. They have a great place with so many wonderful family activities. You can, of course, pick your own pumpkin. There is also a 'train' ride, corn maze, 9-hole mini golf and other fun things to do. However, everything except my magic show was an outdoor activity. So it dampened the turnout just a bit. If your family is looking for some fun activity to do together, even if you already have a pumpkin, it's worth the drive out the Juneau to experience a day on the farm. Be sure to visit their website to see what special activity is happening. Do make the trip though. You'll enjoy it. Fall is definitely here. After the long, dry, hot summer, it is refreshingly cool and delightfully beautiful. Today, I am in my office working on a new routine. Practice, practice, practice. 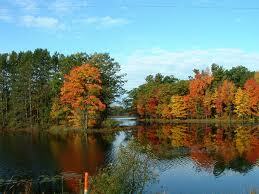 As I look out my window, I can see the leaves blowing and gently falling to the ground. The colors are exquisite this year. Truly a wonderful sight. With the change of season, comes a new season of programs. School programs are back. I'm doing my "Magic of Dreaming Big" motivational program in several schools this month. Then there are the harvest events and parties. October is a big month for those. Everyone from daycare centers to country clubs are hosting parties this month. So I'll be at a lot of those. Mostly, these are private events. However on Oct 13, you can come out to Juneau, WI and see me perform my magic show at Woldvogel's Pumpkin Farm. There's a bunch of family activities to experience while you're there. Take a look at their website to see what's available. Just back from Minnesota. This time I wasn't there to perform any magic. I was there to witness magic -- the magical birth of a new family. My nephew just got married. He and his new bride had a wonderful ceremony in Forest Lake followed by a reception at one of the most unique venues I've every been to. The reception was held at a Library in St Paul. But this isn't your standard library. Its the James J Hill Reference Libray. Built in 1921, it stands three stories tall inside with books lining the marble walls and and floors. It truly is a beautiful space. The couple has great taste-- but an even greater love for each other, I believe. I wish them all the best in their new life together. Having a Saturday off was unusual for me though. I had to plan this several months in advance to make that happen. Typically, I'm at two or three parties during the day and perhaps an evening show as well. Then Sunday I usually have a couple shows in the afternoon and evening as well. So, it was a whirl-wind trip. While some stayed overnight, my family traveled up and back in the same day so that I could be available for my planned shows on Sunday. Needless to say, it was a late night. We didn't get back until almost 3:30 am. But with a few hours sleep, I was refreshed and ready to go. It would have been nice to stay in the area and present one of my educational programs at a couple schools in Minnesota while there. However my son was along, and he needs to be at his own school. So, I'll have to make a separate trip up to St. Paul to present my program. This year I added a program called "The Magic of Dreaming Big." I toured it through the library systems during the summer, and with a few modifications, it is now ready for Schools all over the Midwest. 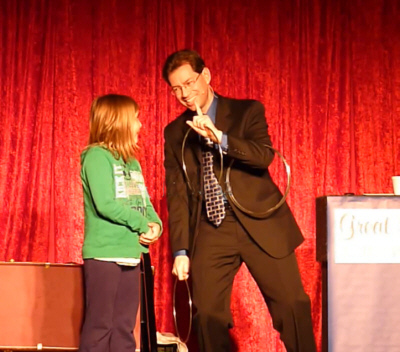 This is a fun, educational and motivational program of magic, music and ventriloquism. The main thrust is to help kids think seriously about their future--but have fun while doing it. I have no doubt it will become a favorite of schools. I know its my favorite to present. Can you believe it? Summer is almost over. Many schools are back in session already, and the rest will be in full swing by the end of next week. Where did the time go? I've been so busy that I really didn't have time to keep track. Soon we'll be pulling out the rakes and light jackets. But before you do that, take some time and think over this past summer -- all the things you did...and didn't do but wanted to. Savor the moments you had together with friends and with your family. Be genuinely thankful for the time you've had. Life is good!! Did you go on vacation? Did you stay home? Either way, life is good. Did you get a new kitchen? Still making do with the one you have? Life is good either way. What's important, what you will truly remember about this past summer are the relationships that you fostered and grew. The times spent just sitting on the deck with your spouse, playing catch with your kids. Family game nights, and 'chillin' with your peeps (no I really wouldn't actually say that phrase in real life). Those are the best memories from summer. Oh, I worked a lot. This was probably my busiest summer for performing. It was fantastic to get to entertain literally thousands of people this summer. I truly loved every minute of it. It's exhilarating. But home and family is the place for refreshment. And I cherish those moments any time of year. Having said that, school is back and this year I have an all new school show to present. Its a modified version of my library program and deals with reading and goal setting. Follow this link to read more about the Magic of Dreaming Big school assembly program. I get asked a lot about where people can come and see my show. The truth is, outside of my library programs, I don't do a lot of performances open to the public. The majority of appearances are for private parties, schools or banquets. Someone is getting married and wants entertainment during the reception. Your company is having its employee picnic, holiday party or employee appreciation banquet. School programs, church programs, or the venerable birthday party are all typical places where I perform. Then I also get invited to home parties for adults. I was at one of these just recently in Brookfield. 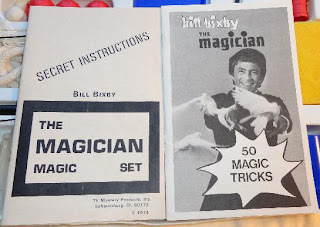 I had performed a few years back for the grandchildren of this couple, and they thought it would be fun to have a magician at their dinner party. It turned out to be a wonderful time. Some people seem to think that a magician is only for children. And as I was being introduced, one lady said "Oh, I should have brought my grandson along." Of course this occasion was all adults, and required a more sophisticated show. Fun, still clean -- but adult. I won't go into all the tricks I performed, but suffice to say, there was plenty of laughter, lots of audience participation, and quite a few puzzled looks at what was happening during the show. In short -- we all had a great time. I think I won over a few skeptics and made a few new friends as well. I love my 'job'. This past weekend was great, as usual. While Sunday was a beautiful day -- almost perfect, Saturday was a bit hot and muggy, as usual this year. Of course I took note of it because I performed outside for most of the afternoon. One of the 'gigs' I had was for a large company picnic down in Racine. The picnic was well attended. I would estimate 500 - 600 people. Wonderful people I might add. I strolled around the grounds and performed closeup magic for as many as I could. But this company really knew how to throw a party. There were bounce houses, clowns, face painters and even a climbing wall. Oh, and there was this great magician as well (wink). What caught my attention most was the talent they had on their stage. In addition to the stage show I presented, there were several bands and solo performers who were employees or family of employees. Some really wonderful acts -- all volunteer! One girl named Sydney Manning played a few songs from an album she recorded. Great stuff! It was a hot and steamy day in Racine for magic. And I loved every minute of it. I ended the day in Shorewood, performing inside of a Culver's. That was different--but it worked out wonderfully. The manager was celebrating a store anniversary -- also with a balloon artist and a face painter. Plus he had the fire department and police there to display equipment and talk to the public. It was a great event. That's a manager thinking outside the box. I think his customers really enjoyed the whole experience. As did I. Even if I ended up loading everything into my SUV in drizzling rain. It was a great day for Great Scott. Visit Great Scott's website to see more. Officially, summer is only one week old, but its moving along at a rapid pace. This is one of my busiest summers yet -- with libraries, day camps, company picnics, family reunions, birthdays . . . and the list goes on. Thanks to everyone that has invited me out to perform for their group. And thank you to all the people who have chosen to come to one of my shows this summer -- especially at the libraries. You have lots of options and chose to come experience one of my programs. I hope I've made a positive impression on your life. There's plenty more summer to go. And it looks like plenty more heat and dry whether as well. I hope to see you around the Milwaukee area -- or if you live in neighboring cities or states, we just might get a chance to meet as well. I'm almost through the first week of performing my new library show "The Magic of Dreaming Big!" The shows are going fantastic, and this is probably my favorite program that I've presented in libraries. Of course I feel that way every year. The Dream Big theme allowed me to present a fun show with a nice encouraging message for kids and adults. It seems to be striking a positive nerve too. At the end of every program I have parents, teachers, and librarians coming up to thank me for the smiles or ask if I come to schools (I do! 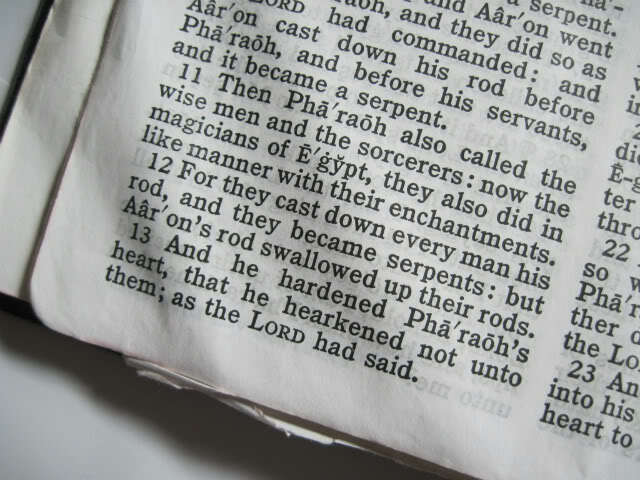 ), or tell me they liked the message. That's very gratifying. The hugs from little ones is great compensation as well. I hope I'm coming to your library this summer. If not, write and tell me where you are, and I can let you know what nearby library you might come a see a show. In my previous entry I promised to talk about another memorable 'first'. 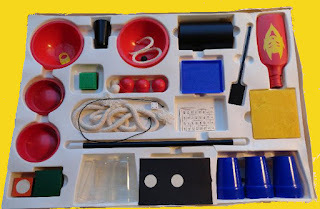 This one also involved entertaining children. It occurred at a daycare in the town where I live. It was late January and I had been hired to entertain the children. The kids were obviously a bit stir-crazy. Those long cold days had kept them inside quite a bit already. So when I arrived to perform, they were ready. This was my first time entertaining a group of preschoolers though. So, I wasn't entirely sure that I was ready. I started my show with a few items that I still use today. Tried and true now, but at the time -- fairly new. The kids responded well. They laughed and enjoyed the magic. They loved the appearance of my rabbit puppet as well as all his antics. The show went over great. I was a hit. Though I didn't realize how much of a hit until I was done packing up and started heading for the door. As if on cue, the children began coming up on their own with arms stretch out offering a hug. Soon I had children hanging on my legs asking me to come back. They continued to follow me down the hall saying "Goodbye Great Scott!" The teachers actually had to call them all back. So . . .I think they liked the show. And I absolutely loved it! That scene has played itself out to varying degrees over the years at daycares and birthday parties. But that was a first, and I'll never forget the feeling. Kids are great! In my last blog entry I mentioned writing about some of the great people I've met so far through the years of entertaining around Milwaukee with my various magic shows. A couple experiences that stick in my memory are actually 'firsts' in my professional magic career. When I was 12 I took up magic as a hobby. I performed shows and liked it, but for some reason, the rest of life crowded out that hobby for a number of years. So, in 1994, I jumped back in. When I decided to start offering my services for hire, a mom in the Waukesha area invited be to perform for her son's fifth birthday. 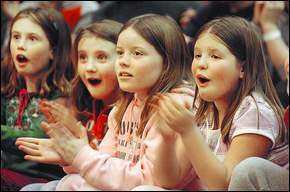 At the time, I wasn't sure performing for children was 'my thing'. But then I knocked on Brian's door. When it opened, there stood the most excited five year old I had ever seen. Well, stood isn't actually correct. He was literally jumping up and down with excitement. His enthusiasm was beyond belief, and my arrival was the focus of that excitement. I really don't remember the show. Brian's mom gave me a nice testimonial, so it must have met expectations. But realizing that I had the power to bring such joy to a child, actually brought quite a bit of joy to me. That sealed the deal for me. Kids are are dynamite audience. That reminds me of another 'first' show for kids. I'll get to that next time. School's Out -- Bring on the Summer Magic! 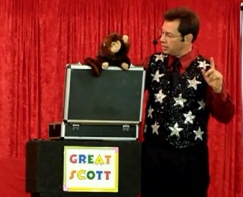 Just got back from my final two school-assembly shows today performing my magic in Racine. This particular school has invited me back for four years in a row now. As I've mentioned before, I love working in the schools. Kids are great!! Summer doesn't end that of course. Now come all the summer activities. And I'm involved in a ton of those this year. I take some time off to vacation, but summer is soooo busy for me. I start next week with performing my library shows -- two a day for most of the month. and part of the next. Then there are the company picnics, reunions, and other assorted summer-time gatherings at which I get invited to entertain. Add to this, fairs, church socials, outreach events, a few banquets and a host of birthday parties and you get a slight understanding of my schedule. But, that's why I do what I do. If I weren't busy, this "job" wouldn't be half as much fun. Why? Because I get to meet so many astounding and interesting people when I perform at any event. In fact some of those stories would be fun to blog about in the future. Here's to seeing you when I'm out and about this summer. 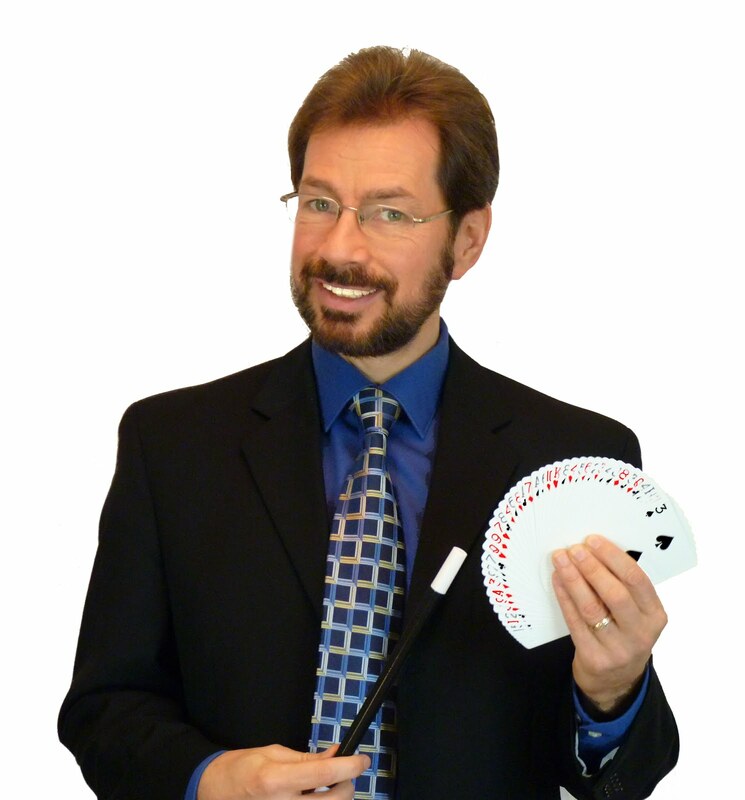 I'll be finishing up the end-of-school year magic shows at several schools in the Milwaukee area over then next week and a half. So if I'm heading toward your school, it'll be a fun show. Lots of laughs and new things this year. If you missed out on the opportunity to have me come and entertain at your school, then now is the time to contact me about next year. Dates are already scheduled for 2013. Of course, as an individual you can come see me at one of the many library programs I'll be performing at this summer. You'll find me traveling around Wisconsin and Illinois primarily. People ask me how I got interested in magic. 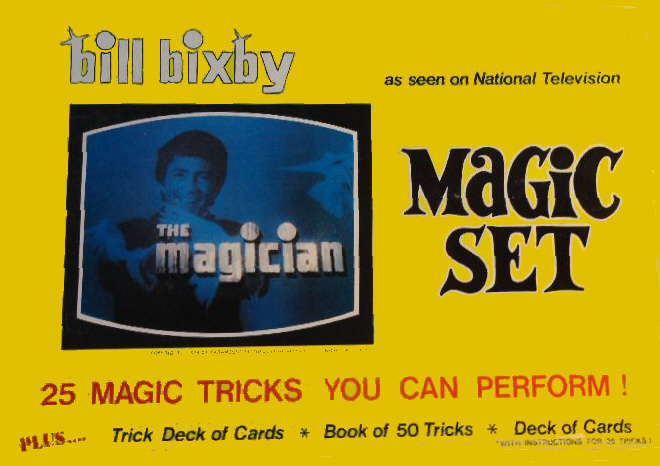 Well back in the early 1970's (when I was a young lad) there was a show called The Magician starring Bill Bixby. It was a short run series that hardly anyone remembers anymore. But I do. You can actually watch the pilot to The Magician on YouTube -- in 9 parts of course. This TV show spawned a little merchandising -- and the Bill Bixby The Magician magic set was born. That's the one I received for Christmas one year. I just happened to find a few pictures of one being sold on ebay. Memories!! If the price tag wasn't $150 I might be tempted to make a purchase. Fortune cookies -- we all get them, read them and then leave them on the table. But when you get one this perfect, you smile, take a picture and post it on the internet. And then when you get this one as a follow up a few weeks later. . .
you smile . . . and post it to the web as well. Library Video of "Clue Into Your World"
Last year I performed at several dozen libraries presenting my "Clue Into Your World" magical program. It was tons of fun. In fact, I've used a slightly modified version in Elementary Schools throughout Wisconsin and Illinois to emphasize Reading and Geographical literacy. Kids seem to love the mystery and mayhem involved. And the teachers love that kids are learning something while having fun. The reason I bring this up now is that I found an article posted on the Wauwatosa Patch regarding my performance last year at the Wauwatosa Public Library. It appears a photographer named AJ Randall photographed the show and put together a wonderful montage set to magic-land music. You can read the article entitled Magical Message Lights up Library Crowd . That was a fun crowd. I did two performances with approximately 350 in attendance at each show. 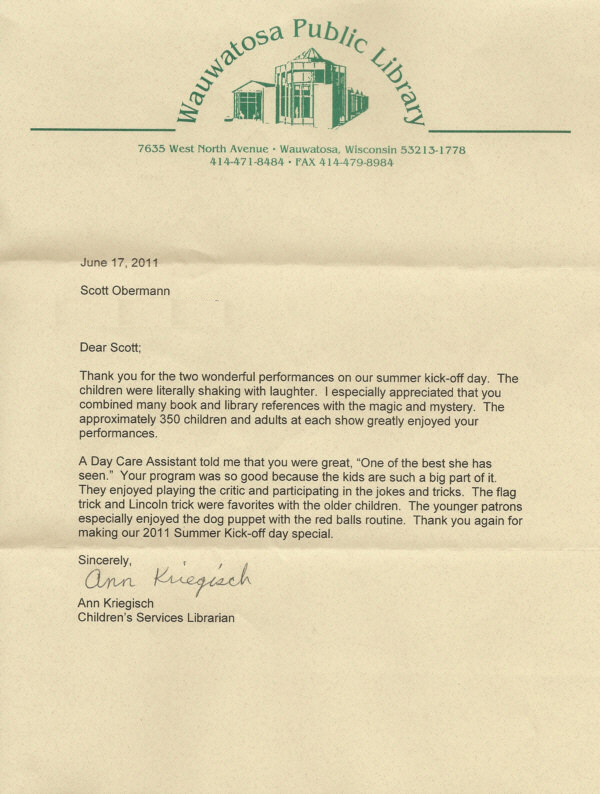 In fact, here is a letter sent by the Children's Services Librarian about the shows. Look for me at your library this summer. If by chance I'm not scheduled to come, feel free to drop my name to the librarian. They always listen to their patrons. I'd love to bring my show to as many libraries as possible! 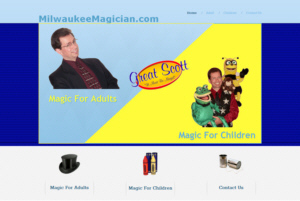 This blog is called Milwaukee Magician. But I actually travel around Wisconsin and Illinois performing at parties year round. I thought it would be fun to share a few ideas that I've seen over the years at parties. I'm at more than a hundred birthday's each year. So that's what I'll concentrate on here. In future installments, I'll tackle other events -- like corporate banquets, or civic club events. Birthday parties are a ton of fun. You do need to do some planning though--especially when the kids are younger. The typical party nowadays that I get invited to has between 10 and 20 guests. I've performed at parties with up to 35-40 children though. Making the party special for the birthday child is the most important aspect of the day. So don't worry about the number of kids. If you have some planned activities that incorporate everyone, you can handle a larger number of kids. Do have some help though. Ask a few of the parents if they can stay. Many like to have a few hours to run a few errands during the party, but there are always a couple of moms (typically) that love helping out. So ask. You'll be glad you did. Decorations are fun. You' don't need to go overboard though. Just do what is comfortable. Over the years I've seen some great ideas -- many of them magic related for obvious reasons. One mom baked each of the children a package of cookies with a star, playing card and rabbit in a hat. Of course you want to involve the birthday child in some way with this type of thing. That's part of the fun and special memories. 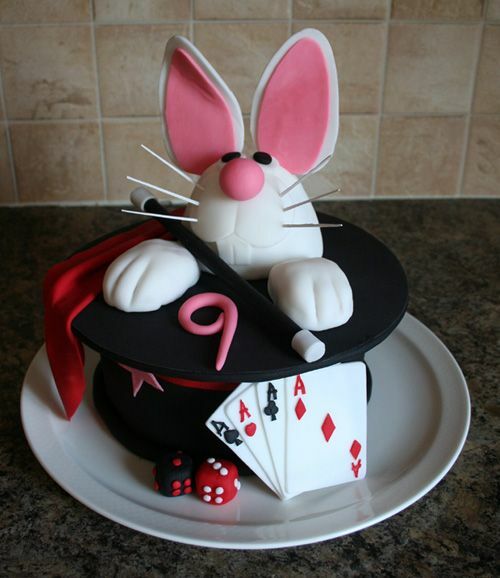 Another mother made a Rabbit-in-hat cake for the party. You can google that phrase and see lots of examples. Another one is rabbit in a hat cupcakes. These look really fun. Recently, I was at a home, and the birthday girl wanted a balloon arch. That takes a special skill to create, but this mom was creative (as most moms seem to be). She used a few helium-filled balloons to support an arch made from paper streamers. I also had a return engagement at a home a while back. That's not unusual, except that this family set up a theater-style curtain for me to perform in front of -- sort of like the one on the right. Very cool -- actually. Also, if this seems like too much to do at your own home. Look around for an off-site location that might work. Hotels usually have conference rooms that they will rent out. You might check with your local library as well. Depending on the availability, they might rent out their conference room for the party. In the summer-time parks are very popular. However, it does rain sometimes, and you want to have a good contingency plan in that event. See if an area park has an indoor pavilion that can be reserved. Those are just a few fun ideas. I'm certain that you can dream up more. You can always contact me via my web address above for a list of great party games for kids as well. Have fun!!! Birthdays, Corporate meetings, Proms, Church services, Sunday school, Daycare centers, Day camps, Libraries, School assemblies, Fund raiser, Cub Scout meetings, Girl Scout meetings, Civic clubs, Assisted Living centers, Family reunions. What do all these things have in common? These are all actual events that I've performed at since January 1 of this year. They speak to the versatility that I bring to each and every event. They also let you know that I am certainly qualified to entertain your group. After all, this is what I do -- full time -- every day. Go to my website and you'll see more about what I have to offer. Watch the video; read the testimonies of people just like you that are now content clients and friends. I perform hundreds of shows each year. So take a few minutes and investigate. Poke around my site and then give me a call. I'd love to hear from you!! Great Scott "It Must Be Magic!" Today is a primary here in Wisconsin. Don't forget to let your voice be heard and cast your vote! I performed a show this past weekend for a group of children and their parents at the Betty Brinn Children's Museum in Milwaukee. This is a fun place for kids, but what impressed me was that each party room was set up like a mini theater. Very nice space for a party. The kids get to sit on padded seats. There's a professional lighting system and sound system as well. I have no idea the cost of renting a room like this, but it's worth checking out. Of course, you can always just invite me to your home to perform as well. -- Just a thought. Visit my website to see more www.wisconsinmagician.com. I just got back from performing an end-of-year program at an elementary school. This is an annual event where the grandparents are invited in to enjoy the day with their grandchildren. The age was Kindergarten through 2nd grade. And I had a blast. This is such a fun age. They love getting silly and just having fun. Plus the grandparents love watching the kids laugh and enjoy themselves. It made my day. Topping off the experience, the organizer asked me to come back again next year. I love it when that happens. It means I did my job well and my work here is not finished! (If I dare call what I do --work). As the saying goes "love what you do, and you'll never work a day in your life." I truly love what I do for a living. There's work to be done for sure though. I'm currently putting the finishing touches on my summer reading program that launches in June in libraries all over Wisconsin and Illinois. If your library needs a fun program why not visit my website to see what's happening. This year we'll be Dreaming Big!! Here we are with only 5 weeks left in the school year. The trees are filled out; the flowers are up; the lawn needs mowing -- again! Plus, my son is finishing his first year of high school. Where did the time go? Soon summer will be full upon us. Though this year we've already had a taste of that weather--and I like it. In the mean time, I've been busy during the week days performing programs in elementary schools around Wisconsin and Illinois. Most of these are educational programs presented in a fun way. However, when the end of the year comes, a lot of schools just want to give the children something to merely enjoy. Sort of a congratulations on a year filled with hard work and learning. These are fun -- can you tell I like to have fun? I do. The educational programs are fun as well, but they require a certain balance of laughter with the serious imparting of core educational content. However, at the end of the year, I get asked by many schools to just entertain the kids. So, in May and June I do quite a few just-for-fun magic shows in elementary schools. These shows are my unique combination of magic, ventriloquism and puppets along with lots of audience participation. We will laugh, and it will be amazing. The children will enjoy every minute -- actually, I will too. It's a great way to wrap up the year. Who knows, I might be coming to your school. If not, you can always call and ask. It certainly was a month for birthdays. I should know. It seems like I performed at most of them. But that's a good thing. Birthday parties are so much fun. The kids are excited, the parents are excited (but for a different reason it would seem), and I'm always excited to walk through the door and be greeted with smiles and cheery faces. This month saw me in living rooms and hotel conference rooms around southern Wisconsin and northern Illinois-- basically my back yard! While the kids love the show, I'm pretty sure the hit is always Max. He's a monkey. He's a puppet. But he's OK with that! Actually, Max is a hit with everyone from the toddlers to Grandma and Grandpa. The text phrase "lol" never fit better than on Max. People really do laugh out loud at his antics. Truth be told, he's my favorite as well. Of course the kids love getting into the act too. And that keeps things fresh for me. I get to work with different children in every show. Each one is unique and brings something new to a routine that I may have performed hundreds of times. In fact, don't tell anyone, but I've gotten some great ideas for my shows from the people that have helped me out. Funny lines; bits of schtick-- its amazing what happens when someone new comes up 'on stage' to help. Sometimes its a great comic moment that will never happen again. But every once in a while...comedy gold happens, and I find a way to make it happen in every show. But wait! It's not just for kids anymore. I've been getting more and more calls to entertain at adult birthdays. Usually those special numbers like 40th or 50th birthday. Some folks think its funny to invite a 'birthday magician' to the party for someone a bit more mature. But that's what I do then--something more mature. I still have fun with the audience, but I get a chance to break out the sophisticated stuff (like groucho glasses -- just kidding!). My motto is Always Family Friendly, Always Good Clean Fun! So, the show isn't filled with blue material, just a lot of eye-popping, mind-bending magic and laugh-out-loud fun. Like a big kids magic show should be! Anyways, feel free to call if you want more information about any of these shows. But try to call at least 6 weeks in advance. Weekends book up faster than most, and I hate disappointing people when they had their hearts set on a Great Scott magic show. I just got back from a day of performing for some of the best audiences I could hope to have. I'm talking about preschoolers. It's great fun to mystify the high school crowd at the the prom, and its refreshing to perform for my peers in a business setting, but these groups don't hold a candle to the enthusiasm of a room filled with 3, 4 and 5 year olds (sometimes even younger!) This group is so gratifying to entertain. I get to be a big silly kid for 45 minutes and experience the laughter and giggles coming from a crowd of happy children. Children's shows certainly have their challenges, and not everyone is cut out for entertaining this age group. But I love doing it. I love seeing eyes wide with astonishment when the magic happens and tearing up from laughter when it all "seems" to be going wrong. I'm a playful guy and full of energy, and performing for preschoolers keeps me active for sure. This summer, along with a host of other shows I do, I'll be performing at a lot of child care centers around the Milwaukee and Madison areas. If you'd like to see me come to your child's center, have the director give me a call. I always have room for a few more preschool shows! Do you remember going to the prom? All dressed up and looking good. Excitement in the air. All that and more. I read today that the average prom goer spends over $1000. Ouch! I know things are more expensive these days, but that sounds a bit steep. So, the costs are up --way up -- from when I was in high school. One thing that has changed, and probably for the better, is the 'after party'. More and more high schools sponsor a lock-in type of party. As long as you stay within the designated area within the building, you can stay all night. Once you leave, you can't come back in though. This seems to give everyone a reason to stick around and enjoy a fun evening...together. That's where I come in. Every year a few schools bring me in to entertain the students during the prom. Sometimes its a full stage-show. 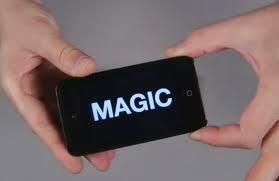 Other times its strolling close-up magic for smaller groups. These are fun events, and I really like performing at these. 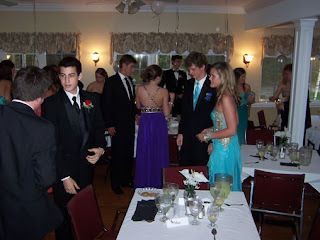 So, its prom season, and once again I'm going to the prom. For me the purpose is a bit different now. Though I must admit --I'm still having fun. I've had the opportunity to minister at a couple church's in the past few weeks. In fact I spend quite a few Sunday mornings in church services other than my own. Sometimes I am invited in to present my gospel illusion show as a special "treat" for the children. Other times I'm given the sermon portion of the service for the entire church. Either way, I feel honored and pray that what I have to offer is a blessing to everyone in attendance. The term "magician" brings some negative connotations with it in the context of a church service. So, I make it clear from the start that it is only tricks and illusion. That may not be necessary, but I want everyone to feel comfortable and free to laugh and be amazed. I also want everyone to take something of substance with them as they go. So my gospel illusion show is more than mere entertainment. It's an opportunity to share some truth -- in a very unique way. Maybe I'll come to your church some day and you can see what I mean. I was out at a couple schools in Wisconsin today doing my "Bee Your Best" character program. I love doing this show for children. It's a fun way to impart a positive message. One of the PTA mom's had seen me at a library program last summer and liked what I did so much that she invited me to her child's school. Great bunch of kids! Thanks Yvonne. While at the second school, I met two children who saw me at a birthday party a few months back. I'm starting to have that happen quite often at just about every show I perform now. . . fame :). Busy, Busy this past week. Spent time in the office catching up on paperwork. I've also been practicing my new show for libraries this summer. This will be a fun summer. By the way, if your company is having a gathering, give me a call. Company picnics or banquets are wonderful places for some magic. I'm getting ready for next week. Though I love just entertaining people, the opportunity to inspire, motivate and teach while doing something fun is highly appealing to me. This coming week allows me to do all of that. Tomorrow morning, I have a birthday party for a student at his school. Top that with a Corporate banquet in the evening where I will be entertaining folks with Close-up magic. Then on Saturday, I have three more birthday parties - in Illinois and the Milwaukee area. Plenty of driving. 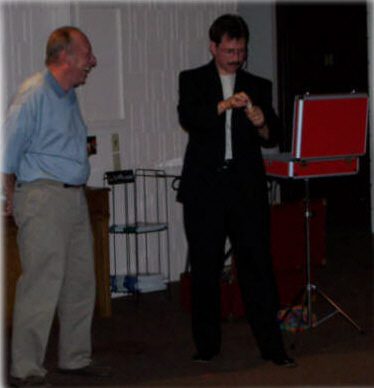 Sunday, I drive north to perform two gospel illusion programs for a church in Sheboygan. This allows me to both entertain and present the Gospel at the same time-- a passion for me. And on the heels of that, I drive across the state to present a program for a cub scout pack in Mt Horeb. This program is a fun way to celebrate the scouting experience and highlight the achievements of each scout in the past year. Monday, finds me back in Illinois presenting my "Clue Into Your World" program to two different school groups. This again is a fun show, but primarily has the dual emphasis of promoting reading and library use as it reinforces key elements in the school's world geography curriculum. Wow. All of that, and it will only be Monday! But that's my life, and I love it. I also love my family, so I do have some down-time scheduled for them as well.